Easily find camp grounds, camp sites and RV parks around the world. 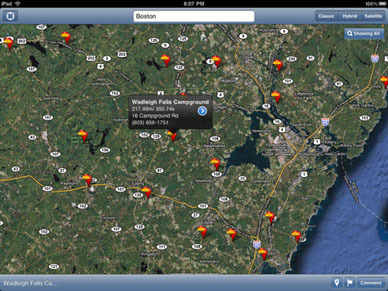 Campgrounds is the premier app for your iPad to help you locate the more then 15,000 camp sites, camp grounds, RV parks, tent camping sites and more around the world. 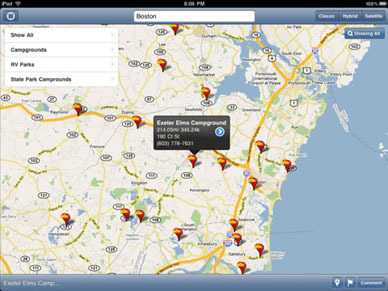 Campgrounds makes it easy to find your next camping adventure wherever you are whenever you want. Today, camping means different things to different people, from traditional camping in a tent, cabin or cottage to today’s full time RVers in a forty-foot fifth wheels with double slide-outs and an entertainment center. We recognize the needs of both traditional and modern campers and have comprehensive information no matter what type of camping adventure you are looking for. Campgrounds in HD for the iPad is the premier source for information on RV parks and campgrounds from North America to New Zealand, so whether you're looking for the perfect park, traveler's tips or things to do when you get there, we're ready to help. 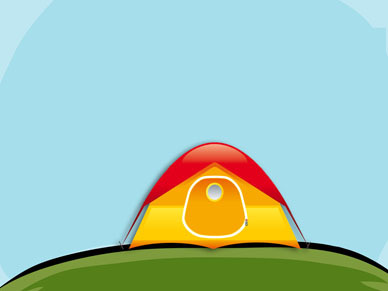 New camping sites are added daily and your app will be automatically updated. Note: This version is not iPhone/iPod Touch compatible. Please download the iPhone version if you plan on using this on your iPhone/iPod Touch.